News photographers rarely finish a day the same way it began. If you start with a news story; you'll end with a restaurant review. Start with sports; end with a society party. Some days that line can move several times in one assignment. I was sent to shoot an Angels baseball game in the summer of 1978 while working at the LA Times. It was a midweek day game, a rarity in Southern California because it’s gets very hot and smoggy, and when the game ends, the game traffic flows into the rush hour traffic, causing gridlock. When they do have these “Businessman’s Specials”, people take off from work to go to the games. I was to shoot some of the game, and get photos of people in suits playing hooky. The Angels at that time were a pretty lackluster team. They didn’t win much and they were generally boring. I had a pretty good action picture from early on in the game, so I was covered there, but the businessman thing; who knew that was going to be the hard part? Between innings I would stand up in the photographers box and look for guys in suits. Most people there were older, and looked retired, or kids with parents who looked like they were on vacation. Into the 6th inning a twinge of panic was setting in. To make deadline, I had to send a picture by the 8th inning. If I left the field shooting position and took a roundabout walk up to the darkroom, I might see someone fitting the businessman profile. Angel stadium at the time had a darkroom for newspapers and wire services to use to transmit photos on deadline. The darkroom was up behind the press box, around the corner from the team owner’s private box. Making my way up through the stands, there wasn’t a suit in sight, just Bermuda shorts and the occasional Hawaiian shirt. After starting to develop my film, I walked out to the press box to see if I could see a businessman. One of the Angels’ ushers walked over and told me to step aside. Turning to see why I had to move brought me face to face with Richard Nixon, fresh out of the men's room. I couldn’t believe it, Nixon. Except for the David Frost interviews, he hadn’t been seen much since he resigned five years before. He looked me in the eye, smiled and walked into the owner’s box, a security guard blocking the door after him. Nixon was living in San Clemente on the Orange County coast. The LA Times had a photographer working for months on getting his picture, with no luck. He still had lots of Republican friends in Orange County who protected his privacy, including Gene Autrey, former cowboy star and current multimillionaire owner of the Angels. The word didn’t come from my mouth, it came from the Secret Service agent’s. I started to speak again. I started to walk away, after all, my film was almost done developing, and I had other important things to do. Another guy in a suit walked out the guarded door, probably on his way to the men's room, and asked what was going on. I told him what I wanted and showed him my assignment sheet and the part about businessmen in suits. He shrugged and took my piece of paper inside, leaving me face to chest with the security guard. He looked down and shook his head. The door opened and the man who took my assignment form waved me in. The Secret Service giant reluctantly moved aside and I walked in. There he was, Richard Nixon. He was taller than I had expected, at least six feet. His head was huge, making the rest of his body seem smaller. He looked me up and down like he was doing a Marine Corps inspection. He looked at the two cameras and camera bag over my shoulder. Noticing the label on the camera bag, he asked what “Domke” meant. It was the 7th inning stretch, explaining why he wasn’t sitting watching the game. I wondered if I hadn't been there if he would be singing "Take Me Out to the Ballgame". The owners box was just big enough for about six or eight people. The 85mm lens I had on my camera wasn’t wide enough to shoot Nixon and the game in the background. I fumbled through my camera bag for a wider lens, but to no avail. “We only have a few minutes before the game starts again young man” Nixon said. As he looked out onto the field, I shot 4 or 5 frames of a much closer portrait than I had wanted, and was ushered out as quickly as I was ushered in. “Uh-sure” was my well thought out reply. Coming out the door, I looked back at the giant security guard. He refused eye contact, or even acknowledging my existence. 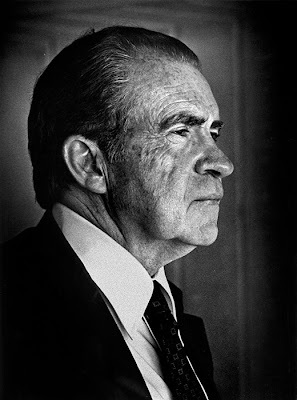 As I walked back to the darkroom, hoping I hadn’t over developed my film too badly, several sports writers in the press box asked me how I got into see Nixon. I told them that all I did was ask. They couldn’t believe it. Finishing up with the film, I called the Times picture desk to tell them I had a picture of Nixon, and to hold the presses; I was sure the publisher would want to speak with me and give me his personal congratulations.